Since autumn 2018, EasternGraphics uses a new model for material creation. The new material model will be used in all new pCon applications . The following pages will introduce you to the so called physically based ren-dering (PBR). You will get to know the essential basics of PBR and will be introduced to its parameters. You will furthermore get tips and examples on creating materials according to PBR and learn how to deal with old materials. Your older materials will automatically be converted to fit PBR. This means that you will not have to rework most of them. Read more here to learn in which cases adaptions will be necessary. PBR simulates what happens when light meets a materials’ surface: A physically correct material has different ways to interact with light: Light is reflected, refracted or absorbed. A material becomes visible to us because it reflects incident light. Furthermore we are able to see materials that shed light by themselves. In natural conditions, light is not absorbed, reflected or refracted to 100%: All materials lie in a spectrum between these extreme points. Reflection, refraction and absorption are also controlled by the material properties. In addition to the material properties, the physical properties of light rays are also integrated in PBR. • According to the principles of energy conservation, only as much light as is incident can be reflected. • The amount of reflected light rays depends on the angle of view. This so-called Fresnel effect leads to stronger reflections for a small grazing angle in comparison to a grazing angle of 90°in relation to the surface. • The values of the various parameters of the material model are linear. The new material model in pCon.planner is based on the principles stated above. The properties of light are simulated by the shader of the render engine and cannot be influenced directly by the user. The different types of materials available in pCon.planner as well as their properties, however, are the base for the creation of physically correct materials. See the following chapter for a guide on creating physically correct materials. • Create materials directly in pCon.planner 8 to get physically correct results. • When working with PBR materials, please use a current version of pCon.planner or your other pCon applications. Older program versions can have a negative effect on the appearance of the new materials. 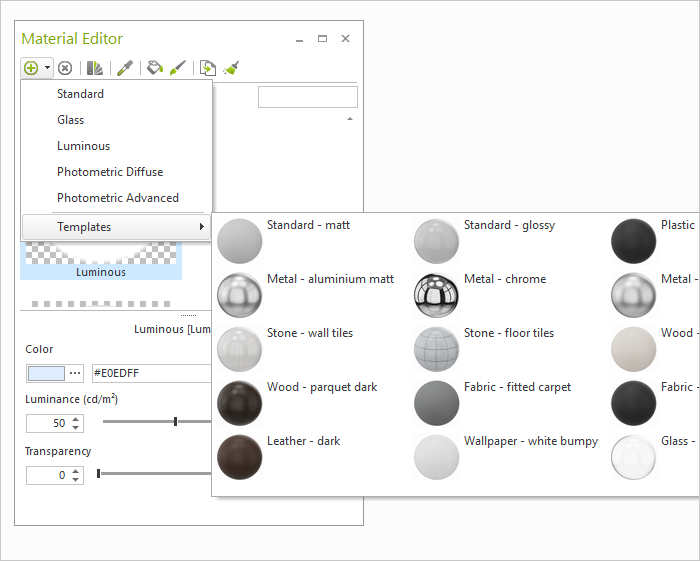 • We recommend that you choose one of the templates from the Material Editor: Whether glass, metal, non-metal or self-luminous material - you will find the perfect base for your own creations. • Do NOT change the saturation of the material. Changing the brightness or adjusting the saturation of the material with an external program would result in unwanted distortion of the material. • Switch to the Textured mode to view materials and textures in their original state as you plan. • When rendering with OSPRay, use the Tone Mapping settings to adjust the brightness and contrast of the image. • Sometimes, the surfaces do appear more glossy than in former versions of pCon.planner. In these cases, use the Roughness slider to adjust the appearance. • It is possible that metal materials are not interpreted as metal (this can for example occur in chrome surfaces). For these materials, please adjust the Metallic slider to 100%. 1. Open the filter line in your Material Editor. Check Read only to get access to materials used on OFML articles. 2. Select the material in the Material Editor. 3. Right click with your mouse to open the context menu. 5. Set the file type to *.mat. Use your external program to edit the material.